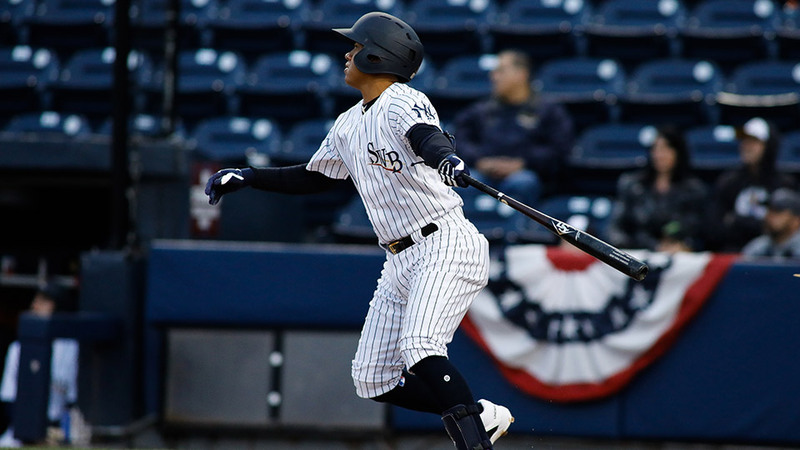 MOOSIC, PA. (April 13, 2019) - Thairo Estrada blasted his first two home runs of the season as the Scranton/Wilkes-Barre RailRiders hit four long balls as a team en route to a 10-4 victory over the Buffalo Bisons on Saturday afternoon at PNC Field. In the top of the second Buffalo loaded the bases with no outs against Scranton/Wilkes-Barre starter Drew Hutchison, but the right-hander bounced back to strike out the next two batters before inducing an inning-ending groundout. That was how the day would go on the mound for Hutchison (1-1), who turned in 6.0 innings of scoreless work, allowing two singles and walking four while striking out a season-high eight. At one point he retired 10 straight Bisons batters and only allowed one baserunner to advance into scoring position all day. The RailRiders immediately capitalized in the bottom of the second when Billy Burns struck a two-run double, plating Ryan McBroom and Zack Zehner to take a 2-0 lead. SWB tacked on in the bottom of the third, as Gosuke Katoh and McBroom walloped back-to-back home runs to open up a 5-0 cushion. Thairo Estrada smacked a solo home run in the bottom of the sixth to extend the RailRiders advantage to 6-0, but the Bisons battled back with three runs in the top of the seventh against David Sosebee to cut the deficit to 6-3. Scranton/Wilkes-Barre battled back in the bottom of the seventh, loading the bases with no outs against Zach Jackson. Kellin Deglan grounded into a double play to plate a run, and after a walk to Burns, Jackson was lifted from the game. New reliever Danny Barnes uncorked a wild pitch to score another run, and Estrada smashed an opposite-field home run to put a cap on a four-run inning which saw the RailRiders take a 10-3 lead. Rex Brothers tossed a 1-2-3 inning in the eighth, and J.P. Feyereisen allowed a run on two bloop hits in the ninth to seal the victory. The four SWB pitchers combined to allow only seven hits and strike out 11 Buffalo batters. The RailRiders look to complete a four-game sweep of the Bisons on Sunday afternoon at PNC Field. First pitch is scheduled for 1:05 p.m. LHP Gio Gonzalez (1-1, 7.20 ERA) takes the mound for Scranton/Wilkes-Barre, while Buffalo counters with RHP David Paulino (0-0, 2.45 ERA). 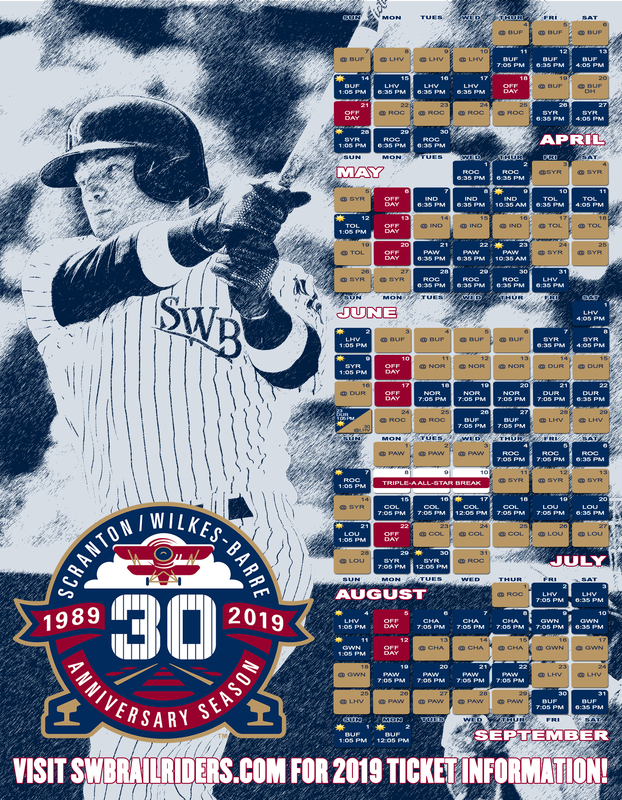 For tickets and more information, call (570) 969-BALL or slide to www.swbrailriders.com/tickets.